Diving into a new sport, or reconnecting with an old favorite, is exhilarating and fun, but getting into the groove of maintenance and equipment upkeep can be overwhelming at first. When Laura Zulliger finally got that kayak she’d been eying, she quickly learned a lesson that all owners of the FootStake have already grasped: boat storage can be one of the most difficult aspects of owning watercraft. 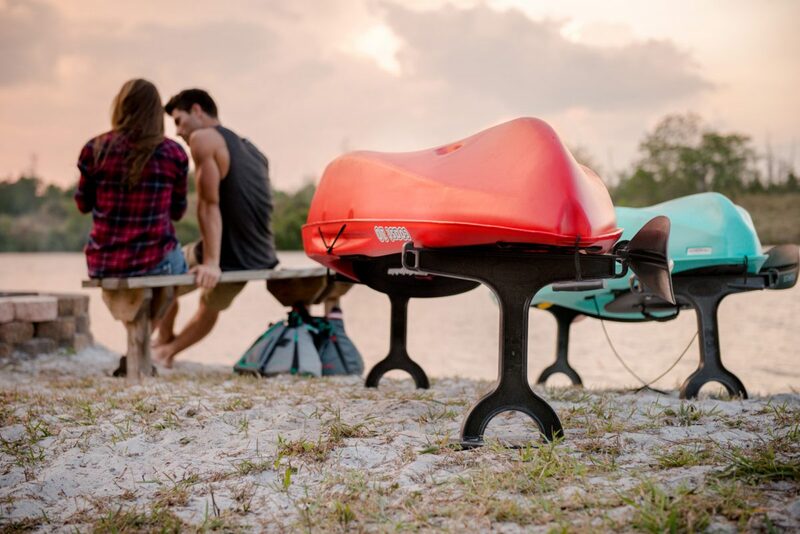 Whether your boat is an SUP, kayak or canoe, you need somewhere to store it. Like Laura, many new kayakers might try to find a convenient place to store the boat, like a stairwell access or other outdoor space, but soon find that this can lead to problems of its own. Keeping your boat outside and in the open in areas that are even only sometimes used by the general public can eventually wear down its surface, not to mention make your life more complicated by putting an obstacle in a common space. Your neighbors might not be too pleased, either! In her review, Laura also said she tried storing her kayak in her boyfriend’s backyard. Eventually, she noticed leaves, grass, and even a spider or two had made the boat their home as a result. When left on the ground, your boat is fair game to the elements and small creatures until the next time you take it out on the water. And of course, constant exposure and contact with the ground combined can equal even more wear and tear on the kayak or canoe’s exterior. Finally, Laura heard about the FootStake! One of the features that drew her in the most was that the stakes were easy to drive into grassy areas, meaning she could easily lift her kayak out of the dirt to prevent further inconveniences like residual grass and leaves. The fact that her kayak was propped up off the ground also enabled Laura to maintain it easier; she could more easily clean it, prepare it for oncoming foul weather, and discourage spiders and snakes from making their home within its cozy confines. And the FootStake’s portability meant that Laura could take hers on the road whenever she wanted to kayak abroad, knowing that the reinforced and padded platforms would be up to the challenge of securing her boat as needed. If you’re the new owner of an SUP, kayak or canoe – or even if you’ve had one for some time – and need a better method of storing your watercraft, contact us and order your FootStakes today!